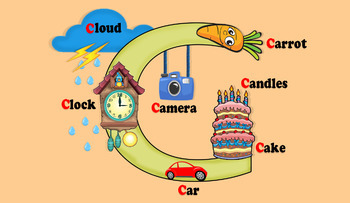 This is my design for the letter C for teaching children to know the letter C with some words related to the letter. Most of available cards include only one word for the children which in most cases is an animal, so this is helping them to widen their knowledge with some examples from the surrounding environment. Designed by hand by me and redesigned using photoshop and ready for printing.